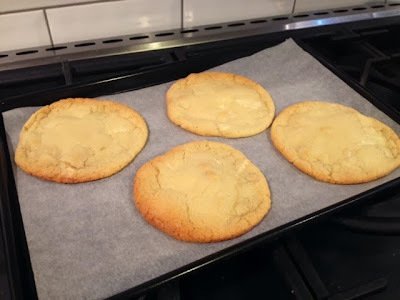 Having hit the nail on the head of how to make the perfect squidgy cookie with my Chewy Chocolate Cookie recipe, I wanted to play around a bit with flavours and ingredients and see what delightful cookie combinations I could come up with. White chocolate cookies are my favourite but the recipe for the milk chocolate ones is probably a bit too rich and would over power the creamier white chocolate. Therefore, I’ve changed the formula a bit, thrown in some nuts for good measure and here we have my white chocolate and macadamia nut cookie recipe. These are lighter and creamier than their milk chocolate equivalents but just as squidgy and delicious. 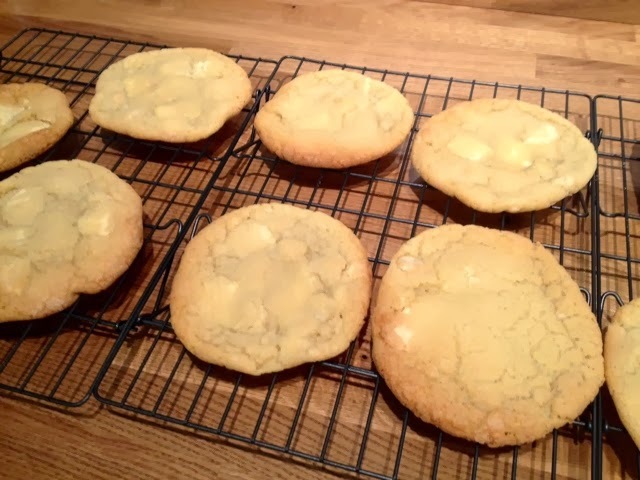 A perfect treat for the Christmas period and a batch of these would even make a great gift. 1. 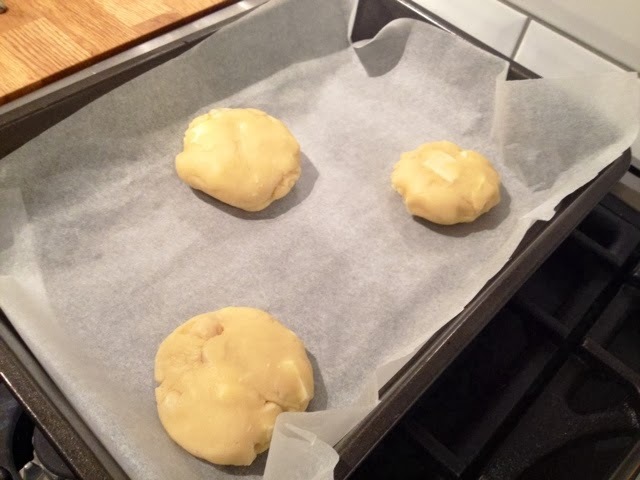 Preheat the oven to 180°C and line a few large baking trays with greaseproof paper. 2. 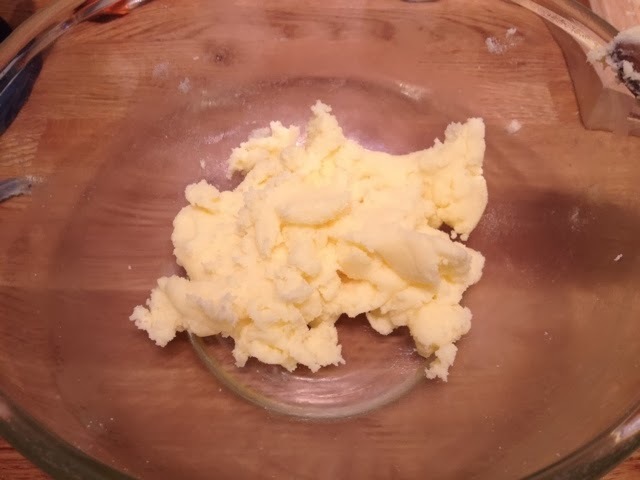 Cream together the butter and sugar until fluffy. 3. 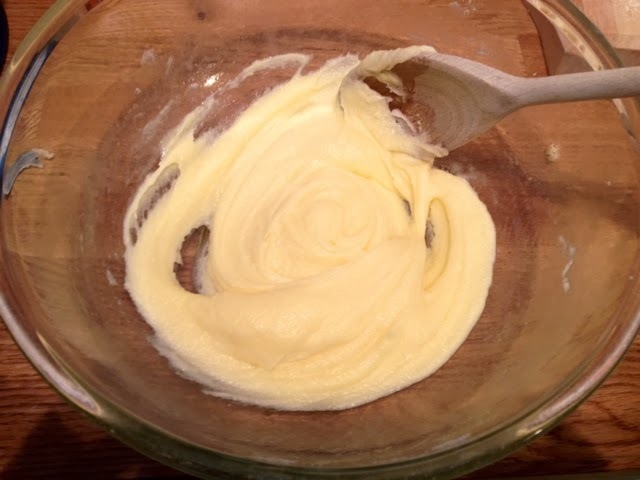 Add the egg and beat into the mixture until smooth. 4. Fold in the flours, salt, baking powder and bicarbonate of soda until a stiffer dough is formed. 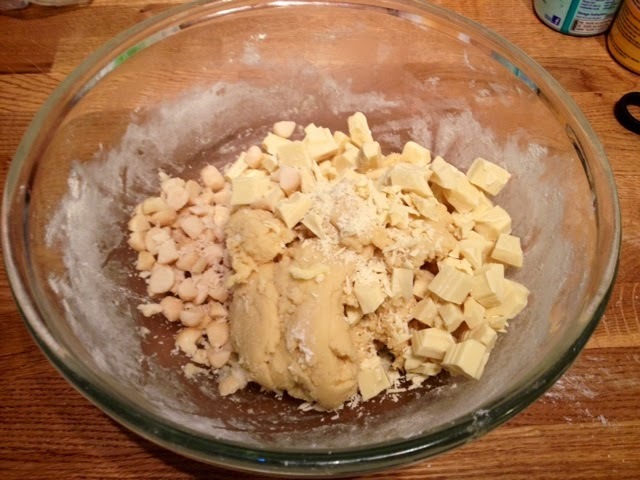 Add the chocolate chunks and chopped nuts and mix through thoroughly. 5. Break of pieces and shape into balls, flatten slightly and place very spaced apart on the trays. Bake for 10-12 minutes until the edges start to turn golden. 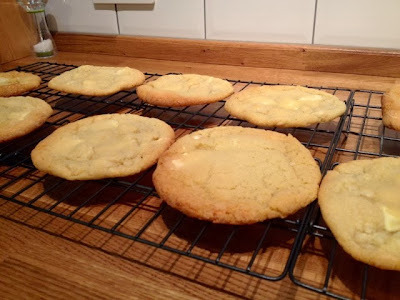 They should still look uncooked in the middle when you remove them from the oven. 6. Remove from the oven and they will still be very soft and too floppy to move so leave to cool in the trays for a few minutes. 7. When slightly cooled and hardened, transfer onto wire cooling racks. 8. Gobble one up while they’re still warm with a cup of tea or wrap them in cellofane and ribbon to give as a Christmas gift.